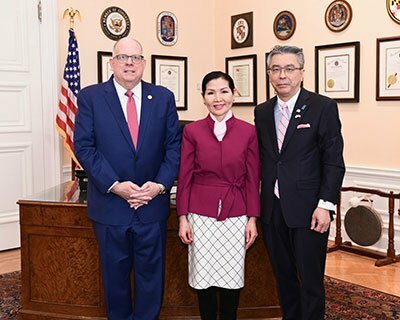 Governor Larry Hogan and Ambassador Shinsuke Sugiyama have signed and renewed a Memorandum of Cooperation that reinforces the relationship between Maryland and Japan. The renewal highlights the regions’ continued commitment to working together to promote trade, investment, life sciences collaboration, academic exchanges, and information sharing. A new addition to this year’s memorandum is sports and business, with a special focus on the 2020 Summer Olympic and Paralympic Games in Tokyo. The memorandum was originally signed in 2016 following the governor’s first overseas trade mission to Japan, China, and Korea the previous year, making Maryland the third state to sign an economic and cultural agreement with the government of Japan. Maryland exported $1.1 billion worth of goods to Japan in 2018, up from $373 million in 2017, in large part due to liquefied natural gas (LNG) exports from Cove Point in Calvert County. Through this agreement, Maryland and Japan commit to working together and exchanging information related to LNG, high-speed rail, and other industries in order to further expand trade and investment.